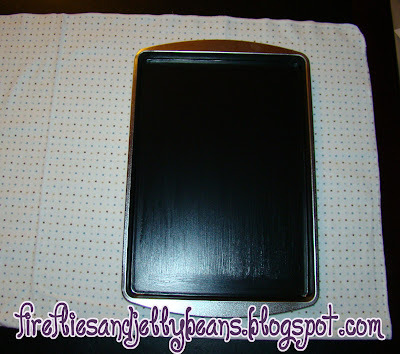 Yesterday I showed you this magnet chalkboard. 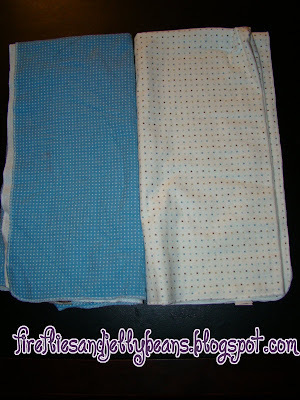 Today I will show you how to make an activity bag to go along with it! 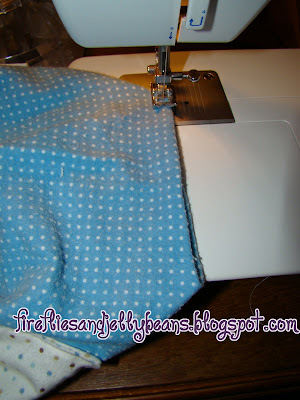 I used to receiving blankets that I don't need anymore (I love recycling!) Each blanket was about 1/2 a yard. 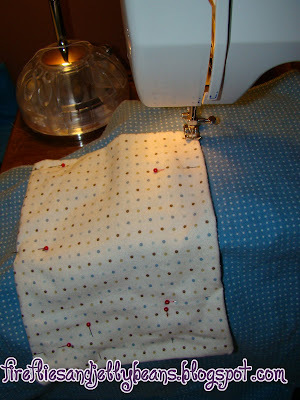 Now to make the pockets. 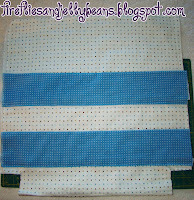 ironed 1/4 an inch fold on ONE side, then fold it in half an iron it. The crayon slots are 1 inch apart (with 1.5 inch spot one each end) and the eraser spots are 4 inches. 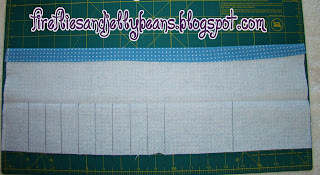 Pin the pocket with it open onto the bag a little bit above where you cut out the corners. 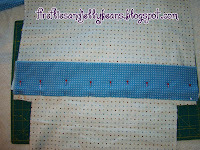 Then stitch a straight line on each mark. 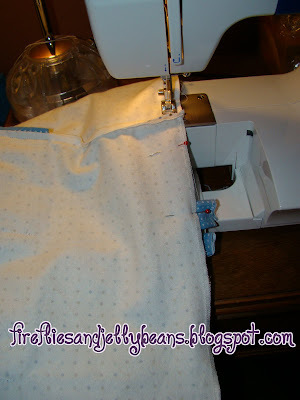 Make sure you are sewing through only ONE LAYER of your outer side! 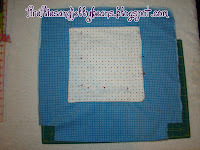 square off each of the corners by pulling on the squares on the corner diagonally and stitching across. 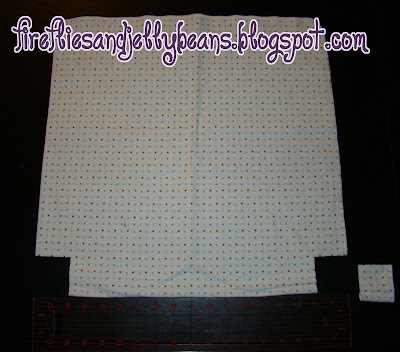 For the pockets I cut out 2 pieces that were about 10 X 20 inches. 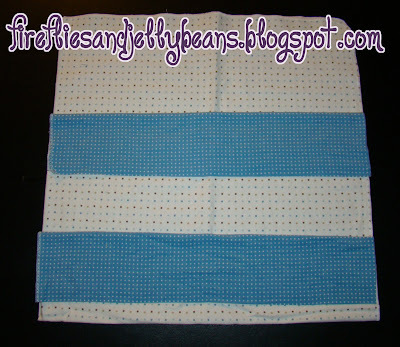 Fold them in half with RIGHT sides together so that it makes a 10X10 inch square. 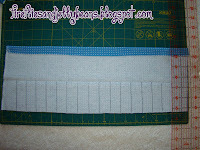 Sewed the 3 open sides together leaving a 3-4 inch opening to flip it right side out. 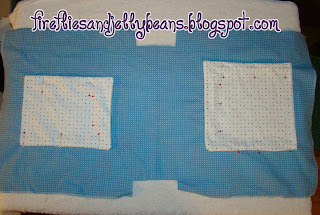 Flip it right side out and pin it to you liner fabric (You will notice that I also cut our 2 inch squares out the the bottom corners for the liner too) Make sure you are pinning through ONLY ONE layer. 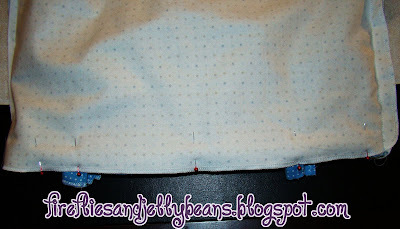 You want you pockets to be facing the TOP of the bag so make sure you are positioning them the right direction. 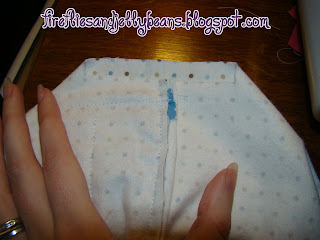 Sew your pocket on... leaving the top open. 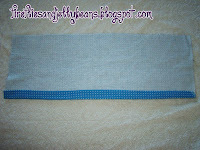 Sew you liner's sides together like you did for the outer side. 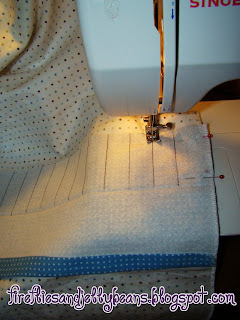 Leave ONE corner open so that we can flip out bag right side out when we sew the liner to the outer side. Iron the edges in about 1/4 of an inch. 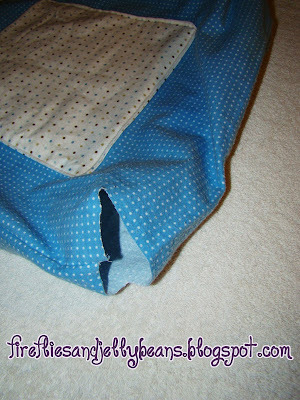 then fold in half an iron. 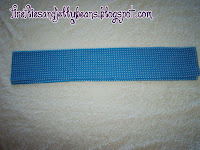 top sew to finish off the edge of the strap. Now let's put the bag together! Put your liner into your outter side with RIGHT SIDES together. 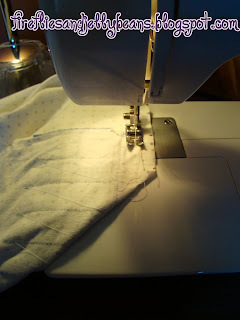 Sew around the top of your bag... you can sew all the way around because we left the corner open to flip it right side out! Pull your bag through the open corner. 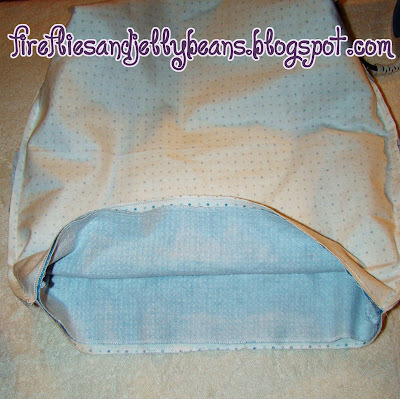 Push the liner inside of the bag and you are done! The outside pockts hold all the markers, chalk and crayons! The inside pockets hold all the magnets. The bag is big enough for the cookie sheet and extra paper. 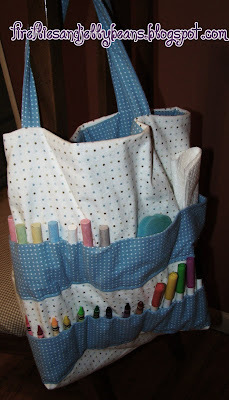 I also add a few coloring books to the bag. 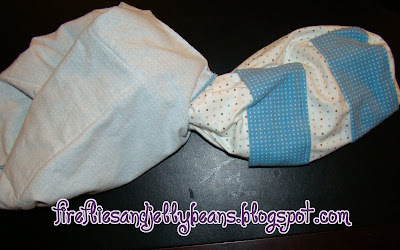 There are lots of possibilies with this bag and it can grow with the child! 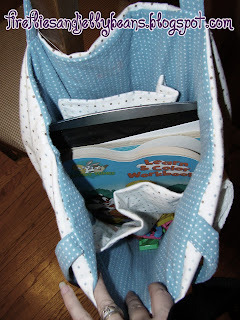 I love the whole idea for this bag & how creative you are for using old receiving blankets! AWESOME! Wow, Fawnda! This is terrific! Great job! How fun!! Love that you used receiving blankets!! 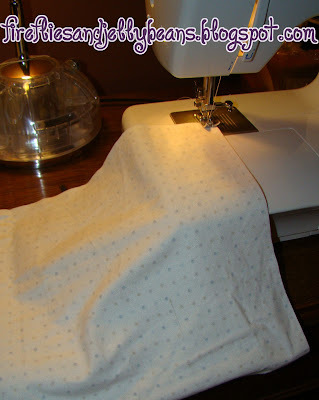 Thanks for linking @Creative Itch's "Sew Cute Tuesday"!! 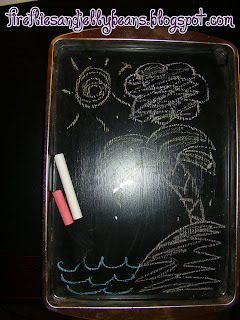 I'm definitely going to make one of these magnetic chalkboards for my son this weekend. Thanks for sharing!!! P.S. 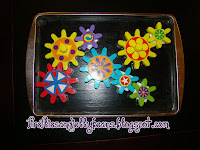 Where did you find those magnet gears? They look like a lot of fun! my son LOVES them! We got them for him for chirstmas. They were $19.99 and came with a ton of gears. This is terrific! Great job! What a cute idea. 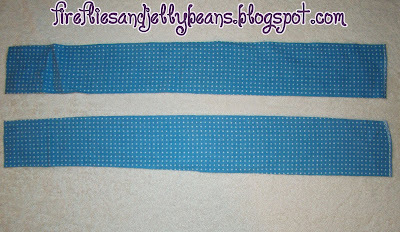 I love the fabric. absolutely delightful! very well done! 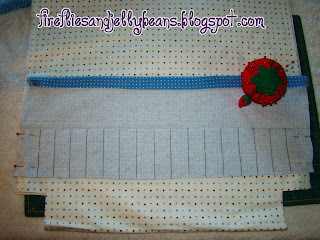 I especially love that it was made from cute littlt blankrts. very clever! Oh wow!! What a problem solver you are!! I cannot wait to find a pan to do this to!! 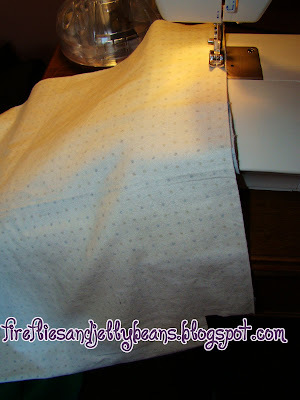 Thanks for linking up this week and come on over and grab a button, we featured you!!! What a great idea! 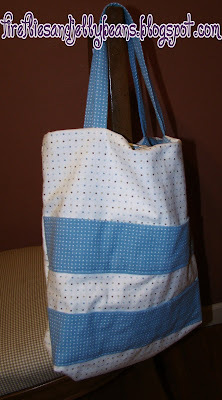 We have a roadtrip with our four-year-old triplets coming up, and these bags would be perfect! And, I have *plenty* of left over receiving blankets. What a fabulous idea! I so need one of these! Stop by the Sunday Showcase Party if you get a chance! 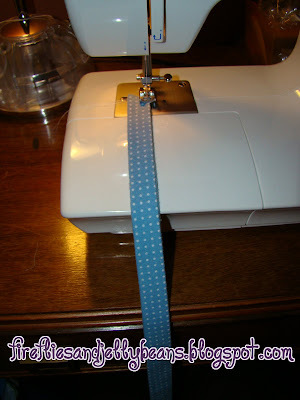 Thanks so much for this tutorial - This is going on my to-do!! Hi, I am new to this blog and love the travel bag! Any suggestions for easy printing of projects? 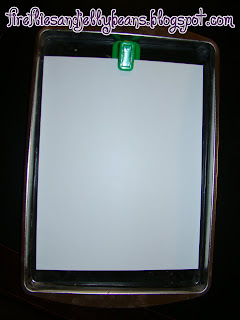 Do you just keep this in the car for stops or is it accessible to the kids while you're driving?